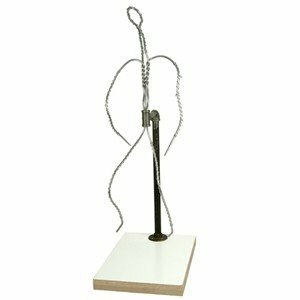 Designed and constructed to be proportionately correct, the FA5 figure armature is an internal support structure or skeleton to hold the bulk of moist clay, Plastilina or other sculpting material that will not support itself while sculpting. 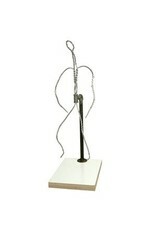 Hand-crafted from a non-staining, pliable aluminum wire, our fully adjustable 18” figure armature is strong yet pliable and includes a backiron made of sturdy steel. This adjustable backiron may be positioned for standing, kneeling or sitting. It is attached to a Formica base on heavy gauge flakeboard or plywood.